Is it an ark or is it a bus? 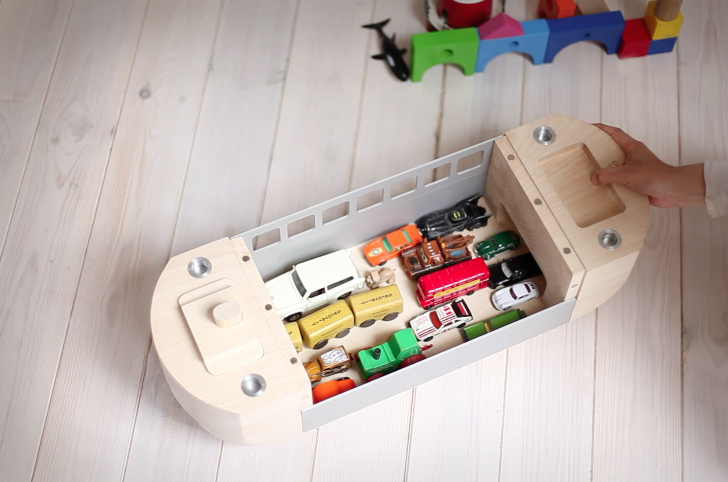 This is the question posed by EMBER Design Manufactory's ROLLARK multipurpose wooden toy. The answer is both, and quite a bit more besides. Perfect in its simplicity and filled with playtime potential, this streamlined wooden toy is made from replaceable components, and is designed by Red Dot Award winning Hungarian industrial designer István Policsányi. EMBER Design Manufactory believe in simple forms and shapes and that it’s through play that we discover joy. They also see high quality as integral to the longevity of that joy and follow a philosophy that things with varied functionality can always be put to new use. The ROLLARK’s design introduces simple and natural shapes, colors and materials that encourage children to play and dream freely. The toy doesn’t dominate aggressively in the middle of play, but instead helps stories to unfold and invites ideas to come alive. It lets the player’s imagination ponder on details, functions and accessories during the game. The ROLLARK is a sturdy, heavy-duty toy, as the essence of the company’s philosophy is that long life will bring appreciation and a lasting value. As a result, every part of the ROLLARK is designed to be strong, easy to maintain, to repair, or to replace. Children can play with the toy indoors or outdoors, they can sit on it, or even stand on it. There’s even the possibility your grandchildren will inherit it thanks to its long-lasting materials and high-precision manufacturing process. Designed to be a high-quality alternative in a world full of low-grade plastic toys, the ROLLARK is made from untreated hard wood, and the company pledges to plant a tree for every unit sold. The body of the toy is made of locally grown beech, ash or acacia, while metal components are made of aluminum and steel, two of the most commonly recycled metals. The designer says the ROLLARK is also not really a toy but a “toy system” that can be extended and recombined. Parts are connected with magnets so everything pops into place easily, even the wheels, and all of the magnetic wheels have a unique double-bearing system, so they can turn and roll freely. If a part goes missing or breaks completely then that part and just that part alone can simply be replaced. All that goodness is a little heavier than cheap-as-chips plastic though. The toys weight around 5–5.5 kilograms each, or 11–12 pounds. For inquiries, contact the manufacturer directly. EMBER Design Manufactory believe in simple forms and shapes and that it’s through play that we discover joy. They also see high quality as integral to the longevity of that joy and follow a philosophy that things with varied functionality can always be put to new use. The ROLLARK’s design introduces simple and natural shapes, colors and materials that encourage children to play and dream freely. The toy doesn’t dominate aggressively in the middle of play, but instead helps stories to unfold and invites ideas to come alive. It lets the player’s imagination ponder on details, functions and accessories during the game. The ROLLARK is a sturdy, heavy-duty toy, as the essence of the company’s philosophy is that long life will bring appreciation and a lasting value. As a result, every part of the ROLLARK is designed to be strong, easy to maintain, to repair, or to replace. Children can play with the toy indoors or outdoors, they can sit on it, or even stand on it. There’s even the possibility your grandchildren will inherit it thanks to its long-lasting materials and high-precision manufacturing process. Designed to be a high-quality alternative in a world full of low-grade plastic toys, the ROLLARK is made from untreated hard wood, and the company pledges to plant a tree for every unit sold. The body of the toy is made of locally grown beech, ash or acacia, while metal components are made of aluminum and steel, two of the most commonly recycled metals. The designer says the ROLLARK is also not really a toy but a “toy system” that can be extended and recombined. Parts are connected with magnets so everything pops into place easily, even the wheels, and all of the magnetic wheels have a unique double-bearing system, so they can turn and roll freely. If a part goes missing or breaks completely then that part and just that part alone can simply be replaced. All that goodness is a little heavier than cheap-as-chips plastic though. The toys weight around 5–5.5 kilograms each, or 11–12 pounds. For inquiries, contact the manufacturer directly.